After signing with the Mets, Young reported to Little Falls in the short-season Class A New York-Penn League. His first season as a pro was fair at best: 3-4 with a 4.53 ERA, as he started nine games and relieved in five others. He did show a live arm, though, striking out 48 in 53⅔ innings. Young returned to Little Falls in 1988 with better results: 3-5, 2.20 in 15 games (10 starts) and 75 K’s in 73 2/3 innings. He moved up to Columbia in the South Atlantic League (Class A) in 1990, doing pretty well: 9-6, 3.49 ERA in 21 games (17 starts). Again his strikeout ratio was impressive, with 127 whiffs in 129 innings. It’s also noteworthy that even in the low minors, Young’s control was not bad, as he walked roughly four batters for every nine innings pitched. Stepping up to Double-A Jackson in 1990, AY had his best pro season. He led the Texas League in both wins (15, against just three losses) and ERA (a superb 1.65). He started in all 23 of his games pitched, and though he wasn’t blowing batters away (95 K’s in 158 innings pitched), he was also walking fewer. He also gave up just three home runs all season. That November, the Mets added him to the 40-man major-league roster. After one more relief appearance four days later, the Mets sent Young back to Tidewater, where he won twice more. Upon returning to New York, he then made eight straight starts from August 29 through October 5. His first big-league win came on September 3 at Shea; he threw seven innings and gave up just one run to his hometown team, the Astros, as the Mets cruised, 6-1. Young dropped his last four starts in a row, but two were tough losses; one of them was 2-1 and the other was 1-0. The 1992 season started auspiciously. In his first outing, on April 9, AY pitched one of his two complete games in the majors; it was a 7-1 win over the Cardinals in St. Louis. On April 19, he got a win in relief at Montreal, pitching the last 3 1/3 innings and getting eight runs of offensive support after he came in. He then proceeded to lose 14 decisions in a row over the rest of the year. Six of those were starts, and the other eight came after manager Jeff Torborg moved him to the bullpen to replace closer John Franco, who was out with a sore elbow. It is noteworthy that Young saved 15 games for the Mets that year (he blew five opportunities). From July 7 through August 28, not a single run was scored against him; he appeared in 20 games and pitched 23 2/3 innings over this span. Young remained in the bullpen to start the 1993 season. Five more losses came in 17 relief outings over April and May, but the streak snowballed after he moved back into the starting rotation at the beginning of June. After one no-decision, he then dropped seven straight starts before returning to the pen. Loss number 26 might have been the most wrenching. Against San Diego on July 7, Young allowed a leadoff single but then retired 23 straight batters before a single and then a two-run homer by Archi Cianfrocco. Meanwhile, Andy Benes and Gene Harris combined on a one-hitter for the Padres. A little over a week after the talk-show chat, Mets manager Dallas Green – never the most tactful or diplomatic of skippers – sent the pitcher down to Triple-A Norfolk, “arguing that Young had neglected his curveball and was too fixated on his slider. ‘Trade me,’ Young said behind the closed doors of the manager’s office. They didn’t trade him.”19 He was recalled in September, and he lost three more decisions after his return, bringing his record as a Met to 5-35. With the Cubs in 1994, Young started 19 times in 20 games, going 3-4 with a 3.92 ERA. His last outing of the season came at Pittsburgh’s Three Rivers Stadium on July 26; his elbow gave out, and he underwent Tommy John surgery in August. He was deemed likely to miss the 1995 season as a result.23 Yet he made a remarkably quick recovery, returning to the minors in May 1995 and to the majors in June. He went 3-4, 3.70 for the Cubs while starting just once in 32 appearances. He picked up two saves. In 28 games for the Astros, all in relief, Young was 3-3, 4.59. His last appearance in the majors came at the Astrodome on June 19, 1996. Houston then sent him down to Tucson, where he got into just four games before recurring elbow pain required more surgery, ending his season. After sitting out the year in 1997, Young tried a comeback in the Cleveland system. With the top Indians farm club, Buffalo, he was 2-3, 6.34 in nine games. He spent some time on the disabled list again and was released in early June. With regard to the scarcity of African-Americans in the majors today, in 2012 Young said, “Hard work pays off. My nephew was drafted in the first round this year.”29 Barrett Barnes, an outfielder from Texas Tech University, was the 45th pick overall in the 2012 draft. He went to the Pittsburgh Pirates in the supplemental first round as compensation for the loss of free agent Ryan Doumit to the Minnesota Twins. Barnes reached Class AAA in 2017. Special thanks to Anthony Young for his input (via e-mail, July 25, 2012). 1 Anthony McCarron, “Where are they now? Former Met Anthony Young emerges a real winner,” New York Daily News, January 3, 2009. 2 Stephen Goff, “Former RHP Young positive role model for youths,” Houston Examiner, May 7, 2009. 3 John Jackson, “Mets’ Rookie Right-Hander Shows Poise,” The Record (Bergen County, New Jersey), September 4, 1991. 6 Mark Herrmann, “AY Has Learned His Lessons Well,” Newsday (Long Island, New York), June 26, 1993. 7 Jerry Wizig, “Assistant Fitzpatrick recalls good times playing for Miami,” Houston Chronicle, September 6, 1991, Sports-2. 8 Harvey Araton, “Autumn Cools Off Young’s Audition,” New York Times, September 29, 1991. 10 Rob Gloster, “Spotlight missed Curtis,” Associated Press, June 26, 1993. 11 Rusty Miller, “Curtis family hoping Young doesn’t break consecutive loss mark,” Associated Press, June 26, 1993. Mark Herrmann, “AY Evokes Memories for the Curtis Family,” Newsday, June 22, 1993. 14 Ed Giuliotti, “Marlins Help Mets End Young’s Slide,” Orlando Sentinel, July 29, 1993, D3. 15 “The Amazing Mr. Young,” Fort Lauderdale Sun-Sentinel, August 1, 1993, 7C. 16 Dan Greene, “Anthony Young,” Sports Illustrated, July 9, 2012. 17 Steve Serby, “Forget the past,” New York Daily News, February 7, 1994. 22 Andrew Bagnato, “Anthony Young, ex-Met of record-loss fame, is trying to start over with Cubs,” Chicago Tribune, May 12, 1994. 23 “Cubs’ Young Likely to Miss ’95 Season,” Fort Lauderdale Sun-Sentinel, August 17, 1994, 5C. 29 E-mail from Anthony Young to Rory Costello, July 25, 2012. 30 Bob Klapisch, “Former Mets hurler has inoperable brain tumor,” NorthJersey.com, January 30, 2017. 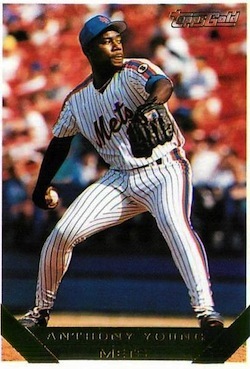 “Former Mets Pitcher Anthony Young,” Sportstalk1240.co/WGBB radio, February 20, 2017, Dan Gartland, “Former Mets pitcher Anthony Young dead at 51,” Sports Illustrated, June 27, 2017. 31 Below Young (15-48, .238) were Dolly Gray (15-51, .208 from 1909 through 1911) and Ike Pearson (13-50, .206 from 1939 through 1948).